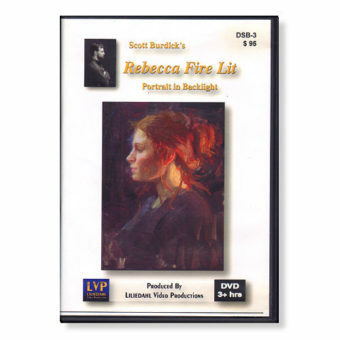 Originele nieuwe Masterclass Dvd-set van bekend kunstenaar Scott Burdick. 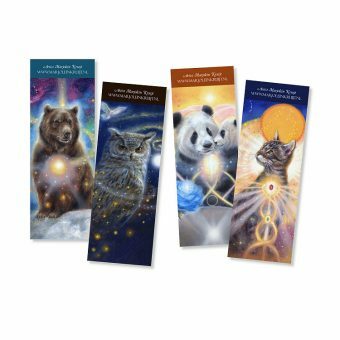 Zie de meester aan het werk als hij ‘Peru Colors’ schildert over 3 dagen verspreid. *Taal: engels, niet ondertiteld. Deze dvd’s zijn niet in Nederland te koop, het gaat dus om een uniek exemplaar. 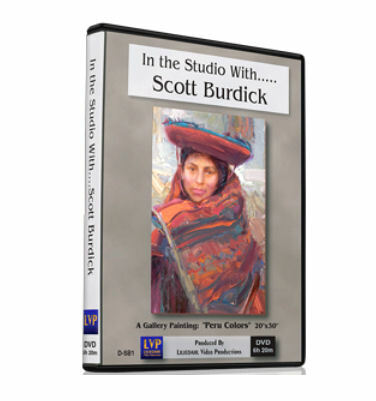 In the Studio with…Scott Burdick offers a great substitute to a workshop with Scott, as it is as informative as the program he would offer in such a class. With limited time to satisfy his gallery and invitational exhibition commitments, Scott is not available to teach as many workshops as students would like. This is a superlative alternative to studying with Scott. Unlike workshop demonstrations of three hours or less, this painting was produced over several days’ time, and is approached from the viewpoint that it is gallery-bound. Scott is careful to explain what he does differently in his own studio when the pressures of a workshop are not a factor. We all want to know how the greatest artists “really” paint when not pressed for time. This video is the answer to that question. 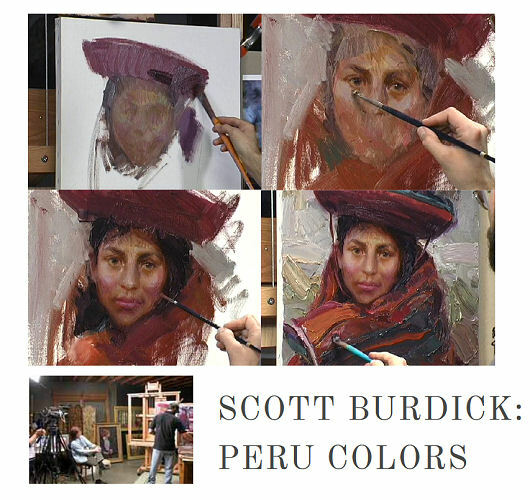 A world traveler, Scott has captured the indigenous costumes of the peoples of the world and has become known for his compelling figure paintings of the peoples of China, Nepal, Thailand, and now…..Peru. While he often paints small sketches or draws these subjects on location in these exotic places, his major works (like this one) are painted back in the comfort of his studio from the considerable library of photographs that he and his wife (artist Sue Lyon) take while on these trips. 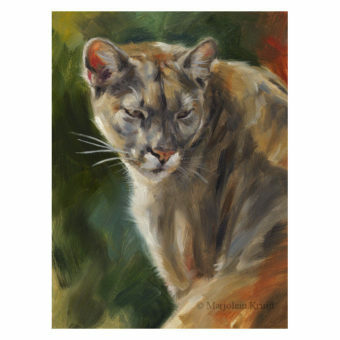 This video shows how Scott works from one set of photographs to complete this striking painting…..and how he selects the information from the photograph for his reference. As a painter thoroughly schooled and practiced in painting from the live model, he offers constructive advice on how to apply that knowledge to original photo references in circumstances where painting from life is not possible. Scott is a very verbal, articulate instructor, and this video is completely filled with his valuable commentary & instruction from start to finish. It will be a classic that should be in every aspiring painter’s library.